The Hearth of Hellenism: Did the Philosophers Believe in God? When you think of philosophy you probably think of the famous Greek trio Socrates, Plato, and Aristotle. These men dominate the history of philosophy from ancient times onward. Their brilliance was sought after later by Christians who wanted to show that their God was the true God. This was done by reinterpreting the polytheistic philosophers of Greece, by distorting their words and teachings, maintaining that their teachings were a precursor for monotheism, and that the philosophers rejected polytheism. Christian church fathers hated Greek philosophy. John Chrysostom described Greeks as “dogs” whose philosophy was “worthless”. Eusebius characterized Hellenism as Greek “excrement” and said it was “loathsome.” Nevertheless, Christianity needed to put into the minds of the people that there was a continuity and cohesion between polytheistic Greek culture and the monotheistic Christian religion. A visual example of this can be found on the walls of one of the Meteora monasteries in Greece where Homer, Thucydides, Aristotle, Plato, and Plutarch are depicted, icon style. This is the Church’s revision of history and philosophy. What did the philosophers teach? How are they being misrepresented? Why do Christians think the philosophers foreshadow the gospel? Let us begin with Socrates. Socrates left no writings of his own. What we know about him comes from his student Plato, who features Socrates in his dialogues, as do Aristophanes and Xenophon in their writings. Socrates appears to be a monotheist by virtue of poor translation (or intentional mistranslation) using the English singular term “God”. Any time you see “God” you need to visually add the before it. Newer translations are fixing this. There is no “capital-G God” when we read the philosophers because god is a common noun like “man”, so we need to read it as referring to one god of the many in the pantheon or just to gods in general, just as is the case when “man” stands for mankind. Socrates was put on trial for impiety and corrupting the youth. At his trial, Socrates feels that it will be difficult to remove the jury’s prejudices, but he goes along with the process anyway, saying, “But nevertheless, let this be as is pleasing to God, the law must be obeyed and I must make a defense.” Here we see the singular God, which is misleading, the proper way to translate the text would be, let this be as is pleasing to the God (one god of the many). The god is probably Zeus or Apollo. Or, since no god is being specified, we could translate “to the gods”. One way Socrates attempts to defend himself is by offering “the god of Delphi” as his witness. Socrates claims that his mission from the god–Apollo, in this case–is to bring wisdom to the Greeks, so they should not be angry with him, for it is the will of Apollo. This and other defenses did not satisfy the jury, unfortunately, and he was sentenced to death by drinking hemlock. Socrates is clearly a polytheist, for he invokes a Greek god in his trial in his defense. It is worth mentioning also that the trial of Socrates and his death was treated by Greeks in a similar manner as Jesus’s passion is treated by Christians. This is a good reason why Christians would want to get Socrates on their side presenting him and his death as a foreshadowing of Jesus’ own sacrifice. Socrates willingly died; he was given the chance to escape by night, his friends tried to break him out of jail but he said no, he would obey the law. On now to Plato. Plato founded the Academy in 387 BCE. The academy would be a hub for philosophy for nearly a millennium, until it was forcefully closed by Christian Emperor Justinian I in 529 CE. Edward Gibbon, in his monumental work The Decline and Fall of the Roman Empire, states that the impact of Christianity on the schools of Athens was more fatal than the Gothic invaders. According to Gibbon, Christianity was hostile to any form of inquiry and exercise of reason. Questions were answered with an article of faith, and anyone deemed to be an infidel or skeptic was condemned to eternal flames. Socrates, for whatever reasons, was condemned as well, but Athens atoned by treating him as a hero for the rest of pagan antiquity. Doing proper justice to Plato and Platonism in the limited space I have for this blog will be unattainable. The details regarding the interaction between Platonists and the Christians are extensive. I will highlight what I think is important and relevant for this discussion. Platonism was the most influential philosophy in the development of patristic theology because it was a dominant force in society. Church fathers could not avoid Platonism if they tried. Christians and “pagans” went to the same schools and received the same education. When developing their theology, Platonism was the “language” Christians used in forming how they thought about God. It is important to stress that simply using Platonism in Christian theology does not imply compatibility; they are irreconcilable on key fundamental issues, such as the relationship between man and the divine. Platonism and Christian theology are not actually harmonious. In my entry, Why Greeks are Leaving Christianity, I pointed out that the monks of Mt. Athos called Plato the “Greek Satan” and would spit on the ground upon hearing his name. In Plato’s writings, he is searching for knowledge that transcends this world, truth which is truly real, eternal, and immutable. Plato thinks that real knowledge requires full participation in the realm of Ideas or Forms. The realm of the forms is a divine realm, the realm of the gods. In the realm of forms, we find the Good, which is the cause of knowledge and truth, and thus is beyond Knowledge and Truth. The Good is also beyond being, surpassing it in dignity and power. Later Christians reading Plato will identify the Good with their God. However, Plato does not describe the Good as a god. Christians turn it into God. Plato is by no stretch of the imagination a monotheist, nor was he developing a philosophy in the direction of monotheism. He called the physical world a “visible god”, and that after death it is possible to join the company of the gods. Christians also diminish his polytheism. As Dr. Edward Butler explained to me, the tactic that is used in appropriating Plato is to ignore what Plato calls “gods” or claim he is being ironic, or merely pandering to popular sentiment. Plato’s “real” theology, they claim, concerns entities, like the Idea of the Good from The Republic, which Plato never calls “God” or implies in any way should take the place of the gods, because it better suits the Christian notion of what a theology ought to look like. Plato’s polytheism is also evident in his criticism of traditional religious beliefs. Plato was harsh on poets and the lies he thought they taught about the gods. For Plato, the gods did not behave in the manner as described by Homer or Hesiod. Gods, according to Plato, could not do harm, nor did they have characteristics that would be ridiculous in them, namely human-like behavior such as jealousy and anger. Plato was reforming polytheism, not abolishing it. Christians had to contend with the Platonists, as they were part of the intellectual elite in society, and Platonists criticized Christianity using their philosophy. Naturally, Christians would have to eliminate this opponent if they wanted to gain power and control the intellectual dialogue in society. This is one reason why the Academy in Athens and other schools were shut down. Eliminating the Platonists and later using elements of their philosophy removed a major obstacle to Christian dominance of society and directed the course of philosophical dialogue. Third and lastly, we come to Aristotle. A similar appropriation as with Plato happened with Aristotle. Christians put their God into Aristotle and developed theology that is not found in his texts, according to Aristotle and the Theology of Living Immortals by Richard Bodeus. Bodeus explains that Aristotle’s actual remarks about the gods are ignored by Christian philosophers, while Christians fashioned a “theology” for him out of the doctrine of unmoved movers, which Bodeus argues Aristotle never intended to be taken as any sort of theology. The unmoved movers is a way in which Aristotle attempts to show that the universe is a singular causal system. Aristotle said there were a finite number of eternal circular motions in the cosmos, which must be oriented toward a system of unmoved movers. But this system, and the prime unmoved mover, which Aristotle describes as “thought thinking itself”, is a far cry in its original intention from Christians’ creator god. Aristotle cannot be viewed as a proto-monotheist. He talks about gods in his works, and in his will, Aristotle requested that statues be dedicated on his behalf to three gods. The executors are to see that the images Gryllion has been commissioned to make are set up when they are finished: these are of Nicanor and of Proxenus, which I had meant to have commissioned, and of Nicanor’s mother and the image of Arimnestos that has been completed, as a memorial to him, since he died childless. (16) They should dedicate my mother’s statue of Demeter at Nemea, or wherever they think best. Wherever they put my tomb, they should collect and place the bones of Pythias, as she herself requested. Because Nicanor returned safely, he should put up stone statues 4 cubits high in Stagira to Zeus the Preserver and Athena the Preserver, in fulfilment of my vow. In closing, given the evidence laid out, it is clear the philosophers were devout polytheists. They were not developing a proto-monotheism that was preparing the way for Christianity. They, along with their philosophy, have been examined with the lense of monotheism, looking for its God to give credence to its theology and beliefs. But the monotheist God is not there: the philosophers did not believe in “God”, but in Gods. The Greek Orthodox Church around the world no longer has a policy of maintaining and keeping alive the Hellenic identity, language, culture or Hellenic heritage. It is now only interested in expanding the number of Orthodox Christians in its ranks. Ορθόδοξων Χριστιανών στις τάξεις της. We should and must be concerned in the well being of Hellenism all around the world! Θα έπρεπε και πρέπει να ανησυχούμε για την ευημερία του Ελληνισμού σε όλον τον κόσμος! From ancient times, at the funeral of a loved one it was the tradition to honour the departed one with a speech (a funeral oration) that celebrated and paid respect to his or her life, the good deeds, the achievements and the contributions of the departed one. It is strictly forbidden for anyone to deny these rights and obligations to be carried out in the Temple at a funeral service. It is considered an enormous crime to do so by the teachings of the Hellenic National Religion & Honour and the Hellenic tradition. WHAT DOES A.H.E.P.A. STAND FOR? If AHEPA was truly dedicated to the protection and promotion of HELLENISM, IT WOULD BE PROMOTING TO ITS MEMBERS and the broader HELLENIC COMMUNITY around the WORLD, the “HELLENIC NATIONAL RELIGION and FAITH", instead of the “Jewish Christian Religion” it is promoting!!!!!! We believe that A.H.E.P.A. should also allow Greeks who are members of the “HELLENIC NATIONAL RELIGION” to become members! By not doing so, this is not only wrong, but immoral, unethical and unpatriotic. The rule stating that one should be a Christian in order to be able to become a member should be modified, so that it states that one should either be a “Christian” or a member of the “Hellenic National Religion” to be able to become a member. Furthermore we believe that at its meetings passages from the works of the ancient Greek philosophers should be read out to the members instead of readings from the Old and New Testaments! After all the ancient Greek philosophers are the true fathers of the Hellenic Nation and the Hellenic people! Αν η ΑΧΕΠΑ ήταν πραγματικά αφιερωμένη στην προστασία και την προώθηση του Ελληνισμού, θα προωθούσαν στα μέλη τους και την ευρύτερη Ελληνική κοινότητα ανά τον Κόσμο, την «ΕΛΛΗΝΙΚΗ ΕΘΝΙΚΗ ΘΡΗΣΚΕΙΑ, αντί την «εβραϊκή Χριστιανική Θρησκεία" που προωθεί!! Εφόσον δεν το πράξουν, δεν είναι μόνο ένα λάθος, αλλά είναι μια ανήθικη και ανθελληνική πράξη. "ΕΛΛΗΝΙΚΗΣ ΕΘΝΙΚΗΣ ΘΡΗΣΚΕΙΑΣ" να γίνουν μέλη του! να είναι σε θέση να γίνει μέλος. αναγνώσεις από την Παλαιά και την Καινή Διαθήκη! Μετά από όλα αυτά, πρέπει επιτέλους να αναγνωρίσουμε ότι οι αρχαίοι Έλληνες φιλόσοφοι είναι οι αληθινοί πατέρες του Ελληνικού Έθνος και του Ελληνικού Λαού! The Greek Orthodox Christian Religion and Church, believes that our forefathers are Abraham, Moses, Isaac, Rebecca and Sara etc. The Greek Orthodox Christian Church and Religion teaches us Hellenes that we are the descendants of the Jews !!! THIS IS THE OFFICIAL GREEK ORTHODOX CHRISTIAN DOCTRINE and BELIEF SYSTEM !!! 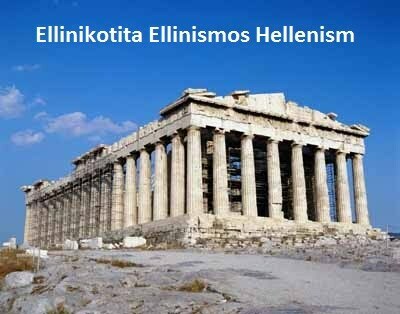 WE DOΝ'Τ BELIEVE THIS RUBBISH THAT UNDERMINES THE DIGNITY(αξιοπρέπεια ) OF THE HELLENIC PEOPLE !!! LONG LIVE THE HELLENIC PEOPLE !!! LONG LIVE : THE HELLENIC NATIONAL RELIGION and HONOUR !!! LONG LIVE HELLENIC PHILOSOPHY THAT GAVE THE WORLD THE GREATEST KNOWLEDGE NEEDED FOR HUMAN PROGRESS !!! Η Ελληνική Ορθόδοξη Χριστιανική Θρησκεία και Εκκλησία, πιστεύει ότι οι πρόγονοί μας είναι ο Αβραάμ, ο Μωυσής, ο Ισαάκ, και η Ρεββέκα, Σάρρα κλπ. Η Ελληνική Ορθόδοξη Χριστιανική Εκκλησία και Θρησκεία μας διδάσκει ότι εμείς οι Έλληνες είμαστε οι απόγονοι των Εβραίων! Εμείς δεν πιστεύουμε αυτά τα "ανόητα πράγματά" που υπονομεύουν την αξιοπρέπεια του Ελληνικού λαού μας και προσβάλουν την μνήμη των προγόνων μας! Ζήτω η: ΕΛΛΗΝΙΚΗ ΕΘΝΙΚΗ ΘΡΗΣΚΕΙΑ! For more information Google: The Future of Hellenism in America, Australia and E.U. After the massive failure and collapse of COMMUNISM some 20 to 25 years ago, it is totally incomprehensible for logical people to understand how one can still believe in COMMUNISM!!!!! It is totally irresponsible for one to believe in communism and to call them a communist!!!! What we now need more than ever is HUMANITARIAN CAPITALISM, (not communism, not socialism and not “The Law of The Jungle” capitalism), with a “Democratic Parliamentary System of Government” and an element of strong “human rights and a free press”. Όχι άλλη ΞΕΝΟΜΑΝΊΑ! ζήτω τα πάντα που είναι ελληνικά! Η Εβραίο-χριστιανοί πιστεύουν πως όλοι γεννιόμαστε αμαρτωλοί... π.χ. ένα παιδί γεννιέται αμαρτωλό;; μα πόσο χυδαία είναι αυτή η δήθεν φιλοσοφία ! Η αμαρτία είναι μια ανύπαρκτη ασθένεια. Εφευρέθηκε για να σου πουλάει ανύπαρκτες θεραπείες. ΕΛΕΥΘΈΡΩΣΕ ΤΟ ΜΥΑΛΌ ΣΟΥ ΚΑΙ ΣΚΈΨΟΥ! The Jewish-Christians believe that everyone is born sinful (A SINNER)...e.g. a new born baby is a sinner ?? ....what a horrible and dreadfull thing this so-called religious philosophy is ! Sin is a none xistent disease. It has been invented to sell you non-existent treatments. RELEASE your mind and THINK! THE FUTURE 0F HELLENISM IN AMERICA, AUSTRALIA and E.U. Is there a future for Hellenism? Will Hellenism Survive? Do we want to survive as a Hellenic people? ΟΙ ΕΥΧΕΣ ΠΟΥ ΔΙΑΒΑΖΕΙ Ο ΠΑΠΠΑΣ ΣΤΟΝ ""ΕΛΛΗΝΙΚΟ"" ΓΑΜΟ. Ευλόγησον αυτούς, Κύριε ο Θεός Ημών, ως ευλογήσας τον Αβραάμ και την Σάρραν. Ευλόγησον αυτούς, Κύριε ο Θεός Ημών, ως ευλογήσας τον Ισαάκ και την Ρεβέκκαν. Ευλόγησον αυτούς, Κύριε ο Θεός Ημών, ως ευλογήσας τον Ιακώβ και πάντας τους πατριάρχας. Ευλόγησον αυτούς, Κύριε ο Θεός Ημών, ως ευλογήσας τον Ιωσήφ και την Ασυνέθ. Ευλόγησον αυτούς, Κύριε ο Θεός Ημών, ως ευλογήσας τον Ιωακείμ και την Άνναν. Ευλόγησον αυτούς, Κύριε ο Θεός Ημών, ως ευλογήσας τον Ζαχαρίαν και Ελισάβετ. Διαφύλαξον αυτούς, Κύριε ο Θεός ημών, ως διεφύλαξας τον Νώε εν τη κιβωτώ. Διαφύλαξον αυτούς, Κύριε ο Θεός ημών, ως διεφύλαξας τον Ιωνάν εν τη κοιλία του κήτους…Μνημόνευσον αυτών, Κύριε ο Θεός ημών, ως εμνημόνευσας του Ενώχ, του Σήμ, του Ηλία…». Αυτή είναι η «ευχή», που παίρνουν οι ρωμιοί από τον ορθόδοξο ιερέα...........και μετά ΄ ήρθε το σκοτάδι !! “ GREEK ORTHODOX CHRISTIAN MARRIAGE "
them, O Lord our God, as emnimonefsas of Enoch, of Shem, Elijah ... ". Priest ........... and then came/comes darkness! Οι Θεοί όλους τους έχει ελεύθερους, η φύση δεν έκανε κανένα δούλο. Είναι η εποχή του έτους, όταν οι άνθρωποι γιορτάζουν και πάλι τη ζωή ενός Εβραίου ανθρώπου με το όνομα Ιησούς που υποτίθεται περπάτησε στο νερό, διέπραξε πολλά θαύματα, σταυρώθηκε και πέθανε στο σταυρό και τρεις μέρες αργότερα αναστήθηκε από τους νεκρούς. Είμαι Έλληνας, δεν μπορώ, και δεν πιστεύω ότι αυτό είναι δυνατό, είναι μεταφυσικό και παράλογο απορριμμάτων που πηγαίνει ενάντια στους νόμους της φύσης! It’s that time of the year when people once again celebrate the life of a Jewish man named Jesus that supposedly walked on water, committed many miracles, was crucified and died on the cross and three days later rose from the dead. I am a Hellene, I cannot, and I do not believe this impossible, metaphysical and illogical rubbish that goes against the laws of nature! Δεν είναι μέρος της αυθεντικής Ελληνικής κληρονομιάς μου!!! It is not part of my authentic Hellenic heritage!!! Απόστολος Παύλος Εβραίος Σαούλ: "Οι δούλοι να υπακούετε στους κατά σάρκα κυρίους σας με φόβον και τρόμον, με ευθύτητα και ειλικρίνειαν της καρδίας σας, σαν να υπακούετε στον Χριστόν. Όχι δε με υποκριτικήν εξωτερικήν υποταγήν, που γίνεται έτσι για τα μάτια και εφ' όσον σας βλέπουν οι κύριοί σας, όπως κάμνουν αυτοί που επιδιώκουν να αρέσουν στους ανθρώπους, αλλά να υπακούετε σαν δούλοι του Χριστού, πράττοντες το θέλημα του Θεού με όλην σας την ψυχήν• με την καλήν και ευμενή διάθεσιν, σαν να υπηρετείτε τον Κύριον και όχι ανθρώπους."